Proterra goes from green to yellow with its buses. The cooperation between Proterra and Thomas Built Buses progressed quickly after Daimler (parent company to Thomas Built Buses) invested in Proterra. 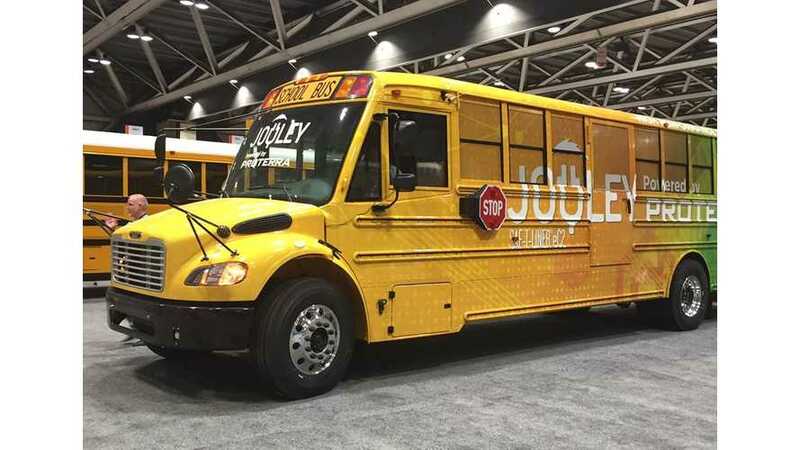 The two unveiled at the 44th Annual National Association of Pupil Transportation (NAPT) Conference the Saf-T-Liner eC2 Jouley electric school bus powered by Proterra. The vehicle can be recharged using J1772 Combo plug (CCS Combo 1) at 60 kW in about three hours, which suggests battery capacity of about 180 kWh. Thomas Built Buses presented Jouley in its first attempt to electrify school buses in late 2017, but probably at the small scale of school buses it was a better deal to share powertrain and batteries with a transit bus manufacturer like Proterra. Hopefully, more electric school buses are coming soon. "The Saf-T-Liner® eC2 electric school bus powered by Proterra represents Proterra’s entrance into a new commercial vehicle sector, the school bus market, and further demonstrates the mass-market shift towards electrification of commercial transportation solutions. The eC2 bus powered by Proterra is being co-developed with Thomas Built Buses in Proterra’s Greenville, SC manufacturing facility.Thomas Built Buses is a subsidiary of Daimler Trucks North America. In September, Proterra announced a collaboration with Daimler, the world’s largest manufacturer of commercial vehicles, to explore opportunities to incorporate Proterra’s electric vehicle technology into Daimler’s commercial vehicle platforms. The Saf-T-Liner eC2 bus powered by Proterra is the first of these vehicles to be unveiled. Designed from the ground-up with an emphasis on safety, durability and performance, Proterra battery packs provide industry-leading energy density and proprietary battery thermal management to ensure optimal vehicle performance and safety. Proterra battery systems undergo rigorous testing and incorporate both active and passive safety systems. The eC2 bus powered by Proterra can be charged with industry-standard J1772 CCS plug-in charging technology, including the Proterra 60kW charging system, in about three hours."